The long list of deep state operatives working covertly to undermine Donald Trump now includes numerous officials appointed by Trump himself. (This a testament to their deviousness.) The most recent is Jerome Powell, who chairs the Federal Reserve. Trump has complained to aides that his new antagonist will “turn me into Hoover” and privately inquired about firing him. 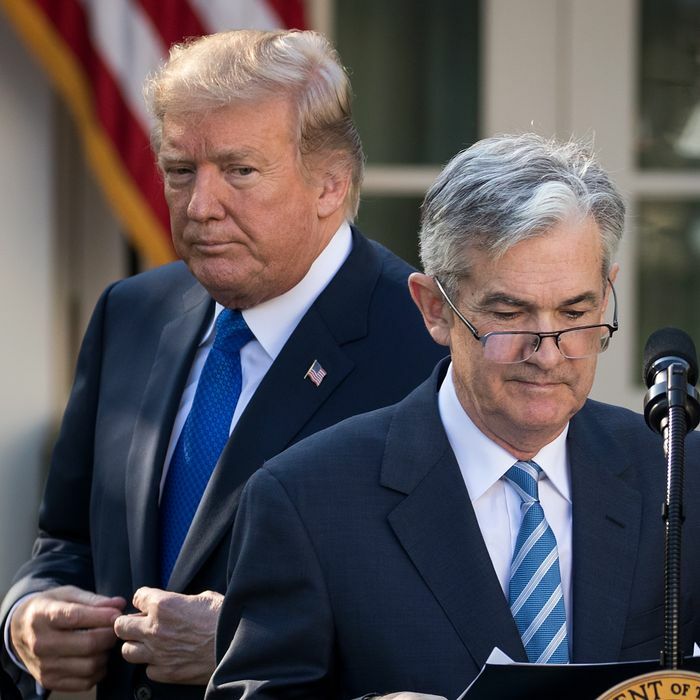 Trump is furious that Powell, joined by the entire Federal Reserve Board, is slowly raising interest rates. This is standard Federal Reserve behavior. Interest rates are the government’s primary tool for smoothing out the business cycle. When the economy is in recession, the Fed reduces rates in order to encourage more lending and economic activity. Accordingly, when the economy is running hot, it raises rates, both to prevent inflation and to give itself more room to cut rates when the downturn arrives. This is not to say the Federal Reserve is always correct (it definitely isn’t) or that it’s correct right now. There’s a coherent case that the Fed is making a serious mistake. This argument holds, in a nutshell, that the economy is much weaker than policy-makers assume. A combination of long-term structural changes and the lingering effect of the last two recessions, this argument goes, have left the labor market weaker than traditional statistics would indicate. The economy can therefore grow longer and faster, the argument goes, before any restraint is necessary. What’s more, a precipitous rate increase might throw the fragile recovery into an unnecessary recession. But you know who doesn’t have a dark view of the economy? Trump. The president has relentlessly touted the recovery as the greatest ever. If Trump is right, of course, then this soaring rocket ship of a recovery which he has overseen — or, according to Trump, single-handedly engineered through his combination of corporate tax cuts and turning over regulatory enforcement to the business lobby — could easily withstand some small interest rate hikes. Indeed, it would be prudent to raise rates now, while the economy is in the midst of the greatest recovery ever, to ensure both its continuation and to have tools on hand to revive it, whenever that becomes necessary. Oddly, that is not Trump’s position. Equally odd, Trump’s views on monetary policy did not line up with his public assessments of the economy during the last administration, either. When Barack Obama was presiding over essentially the same economic conditions, Trump derided it as “the weakest so-called recovery since the Great Depression,” with “94.3 million Americans outside the labor force.” This dismal analysis would imply that the Federal Reserve needed the lowest possible rates to sustain the recovery on its meager trajectory. But no — Trump lambasted the Fed for leaving rates too low. Janet Yellen should be “ashamed,” he said in 2016, for leaving interest rates low. So Trump was calling for higher interest rates during the pathetically weak Obama recovery, and is now demanding low rates during the Trump boom. Obviously these wildly inconsistent views are perfectly consistent with Trump’s position that every positive development in the world is due to him, and every bad thing is the fault of somebody else. If your economy is a couple tiny interest-rate bumps from making you the next Herbert Hoover, you may not have quite as much confidence as you are attempting to project.